Choosing countertops for your new kitchen can be a big decision to make. 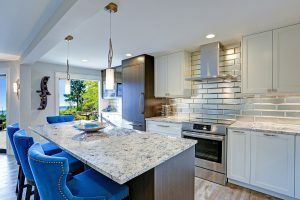 Whether you are moving into a new place or getting ready to sell, a kitchen renovation can significantly increase the value of your home, and one of the factors that strongly impacts the quality of your kitchen is the countertops. You may have heard the luxury benefits of marble and granite, but quartz is growing in its popularity as one of the most suited materials for worktops. Read on to learn why quartz countertops are the optimal choice for your kitchen. Quartz as used in worktops is engineered out of natural quarried quartz crystal (approximately 90% composition) and acrylic resin (approximately 10%). This makes it exceptionally strong and less likely to crack, chip, or scratch than granite. Quartz countertops are also impervious to liquid. This has many benefits in terms of functionality and use in the kitchen, including reduced risk of bacteria and mildew, easy clean-up, and resistance to stains. This low-maintenance material also does not require any additional sealing to keep its radiant sheen. Beyond the functional advantages of quartz, it also has many design benefits due to its manmade manufacturing. First, it is often available in a wide range of colors which you can select to perfectly suit your kitchen design. Second, the patterning of its surface is often more uniform and homogenous than natural materials like granite. If you do prefer a more organic look, however, that is also frequently available in quartz as well. For these reasons, it should be clear that quartz countertops are an ideal choice for your kitchen. Not only do they impart and modern, luxurious look to the space, but they are also highly functional and add value to your home. Be sure to work with a professional contractor who can guide you through the fabrication process from slab selection to installation and help you make the best design choices for your space.